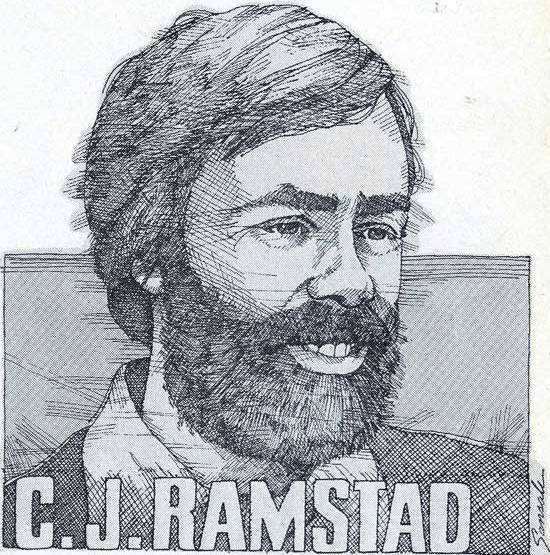 It's been 11 years since legendary snowmobile journalist CJ Ramstad and his son J.J. died in a tragic automobile crash. Today would have been CJ's 73rd birthday. I’m remembering his life by sharing this awesome column he wrote in his Letter From Pops column for the November 1982 edition of Snowmobile magazine. Letter From Pops and his book The Collected Works of Pappy were mainstays of his early career, as well as entertaining reading for snowmobilers all over the world. I grew up reading this stuff and it's still very dear to my heart. Happy Birthday CJ. And thanks for the gifts you gave us. I don’t need a calendar to know when winter’s just around the corner. Even if the weather’s been nice and warm, I have an infallible clue that alerts me to the soon-to-come (and always welcome) cool winter weather, snowfall and frozen lakes. The way I know for sure the white stuff is on the way is the appearance on the doorstep of my lonely dyno station or at the entrance to my Secret Pops Cave of two or more dirty, belt dust-covered snowmobile carburetors. This event is as sure as sunrise, as sure as age. I’ve always regarded these buggers as relatively simple, easy-to-understand fuel mixers requiring very little repair or maintenance beyond the occasional replacement of a worn inlet valve or re-jet for temperature but, judging by the mail trundled up her each fortnight by pack mule, there are many, many sledders who do not share this view. For sure there are some members of the elite High Plains Drifters who think otherwise. If I didn’t nurse their carbs for them, our club would be decimated. Carburetors got their reputation for complexity in the snowmobiling during a dark age in the sport we now call the epoch of the pumper. 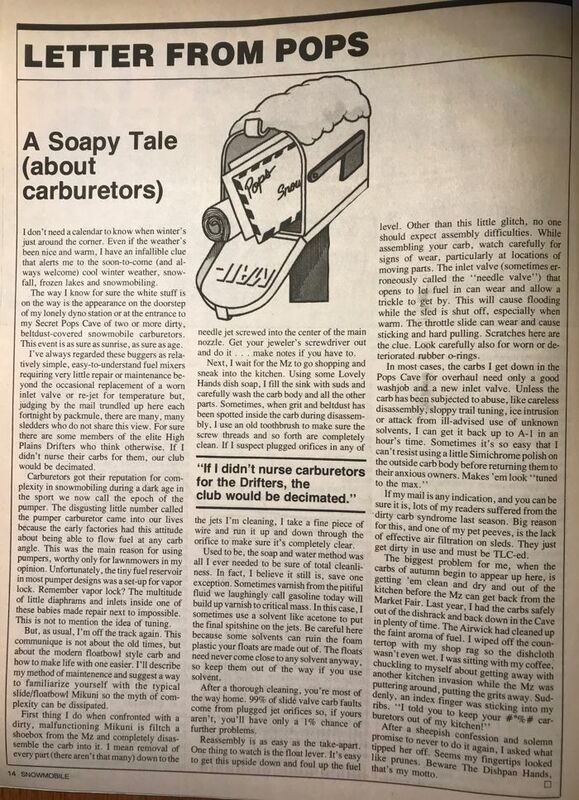 The disgusting little number called the pumper carburetor came into our lives because the early factories had this attitude about being able to flow fuel at any carb angle. This was the main reason for using pumpers, worthy only for lawnmowers in my opinion. Unfortunately, the tiny fuel reservoir in most pumper designs was a set-up for vapor lock. Remember vapor lock? The multitude of little diaphragms and inlets inside one of these babies made repair next to impossible. This is not to mention the idea of tuning. But, as usual, I’m off the track again. This communiqué is not about the old times, but about the modern float bowl style carb and how to make life with one easier. I’ll describe my method of maintenance and suggest a way to familiarize yourself with the typical slide/float bowl Mikuni so the myth of complexity can be dissipated. First think I do when confronted with a dirty, malfunctioning Mikuni is filtch a shoebox from the Mz and completely disassemble the carb into it. I mean removal of every part (there aren’t that many) down to the needle jet screwed into the center of the main nozzle. Get your jeweler’s screwdriver out and do it...make notes if you have to. Next, I wait for the Mz to go shopping and sneak into the kitchen. Using some Lovely Hands dish soap, I fill the sink with suds and carefully wash the carb body and all the other parts. Sometimes, when grit and belt dust has been spotted inside the carb during disassembly, I use an old toothbrush to make sure the screw threads and so forth are completely clean. If I suspect plugged orifices in any of the jets I’m cleaning, I take a fine piece of wire and run it up and down through the orifice to make sure it’s completely clear. Used to be, the soap and water method was all I ever needed to be sure of total cleanliness. In fact, I believe it still is, save on exception. Sometimes varnish from the pitiful fluid we laughingly call gasoline today will buildup varnish to critical mass. In this case, I sometimes use a solvent like acetone to put the final spit shine on the jets. Be careful here because some solvents can ruin the foam plastic your floats are made out of. The floats need never come close to any solvent anyway, so keep them out of the way if you use solvent. After a thorough cleaning, you’re most of the way home. 99% of slide valve carb faults come from plugged jet orifices so, if yours aren’t, you’ll have only a 1% chance of further problems. Reassembly is as easy as the take-apart. One thing to watch is the float lever. It’s easy to get this upside down and foul up the fuel level. Other than this little glitch, no one should expect assembly difficulties. While assembling your carb, watch carefully for signs of wear, particularly at locations of moving parts. The inlet valve (sometimes erroneously called the “needle valve”) that opens to let fuel in can wear and allow a trickle to get by. This will cause flooding while the sled is shut off, especially when warm. The throttle slide can wear and cause siticking and hard pulling. Scratches here are the clue. Look carefully also for worn or deteriorated rubber O-rings. If my mail is any indication, and you can be sure it is, lots of my readers suffered from the dirty carb syndrome last season. Big reason for this, and one of my pet peeves, is the lack of effective air filtration on sleds. They just get dirty in use and must be LTC-ed. After a sheepish confession and solemn promise never to do it again, I asked what tipped her off. Seems my fingertips looked like prunes. Beware The Dishpan Hands, that’s my motto. the pops and pappy things were great reading. they made him seem like he was and old grandpa but he must have actually been pretty young. thanks for the memories. Rode the first bus down from Proctor to Spirit Mt. a couple of times with CJ. Always think about him now every time I make that trip to our Mecca. Hope to see you next week John!